Yet another repaint/repurpose of Stephan1918's EXCELLENT First Eagles cargo ships. 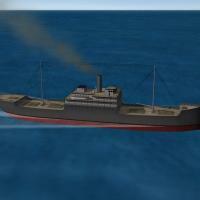 This time, we're representing merchant ships of the Italian Navy (Regia Marina) of WW2. These ships ARE armed, to 2 20mm guns, so they WILL shoot back when under attack!! edit: the ship is NOW in the zip. sorry folks!